On the 17th-21st July 2017, several memebers of SWICO joined the International Astronomical Union Symposium at University of Exeter, UK. The subject of the symposium was “Space Weather of the Heliosphere: Processes and Forecasts” and they presented several projects. 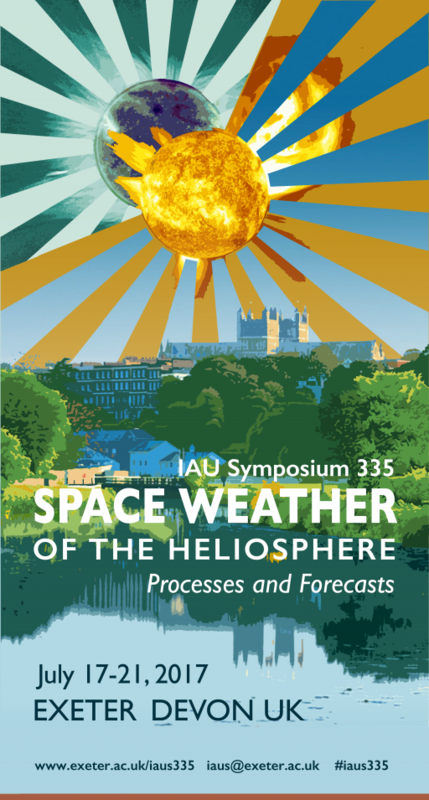 Among the others, Mauro Messerotti (INAF-OATS) gave an invited talk on “Defining and Characterising Heliospheric Weather and Climate”. The talk was focused on the basic definitions, phenomenology and workflows that lead to monitoring, modelling and predicting both Heliospheric Weather and Heliospheric Climate by pointing out gaps and pitfalls that can affect the development of a robust operational machinery. This requires step forwards in understanding the physics of heliospheric phenomena via long-term, multi-wavelength, and multi-scale observations, still a chimera despite the social benefits it could provide. Stefania Lepidi, from Italian Istituto Nazionale di Geofisica e Vulcanologia (INGV), presented two posters in the session “Impact of solar wind structures and radiation on magnetospheres”. The first poster deals with the determination of the Earth’s magnetic dip poles using measurements from the Swarm ESA’s constellation of satellites; the second one, in collaboration with the University of L’Aquila, was about the determination of the southern polar cusp location from geomagnetic ground measurements at a pair of Antarctic stations. In both works, the magnetospheric dynamics related to the interaction with the external interplanetary magnetic field was investigated. Roberta Forte (UTOV) gave a talk in the session “Space weather monitoring, instrumentation, data and services: Future Missions and Instrumentation”. The focus of the talk was the calibration pipeline and the first data analysis results of the MOTH (Magneto-Optical filters at Two Heights) instrument, a dual channel telescope, based on Magneto-Optical Filters (MOFs), that provides full disk line-of-sight Doppler velocity and magnetic field at two levels in the solar atmosphere, useful to investigate atmospheric dynamics and Space Weather phenomena. Two posters were presented in the same session. A first poster introduced the SWERTO service, an operational Space Weather service that will allow to access scientific data mainly from satellite-borne (e.g.,PAMELA, ALTEA) and ground-based (e.g., IBIS, MOTH II) instruments in which UTOV Space Weather team is involved. A second poster presented the Ionospheric Prediction Service (IPS) project, a collaboration of Telespazio (coordinator), Nottingham Scientific Ltd, Telespazio Vega Deutschland, the University of Nottingham, the University of Rome Tor Vergata and the Italian Institute of Geophysics and Volcanology (INGV), with the aim of designing and developing a prototype platform able to translate the prediction and forecast of the ionosphere effects into a service customized for specific GNSS user communities. Gianluca Napoletano, from University of L’Aquila, presented a poster in the session “Forecasting Models” about a probabilistic approach to Interplanetary Coronal Mass Ejection Propagation developed using a Drag-Based Model.